Oxton memories by Mrs Betty Lees M.B.E. 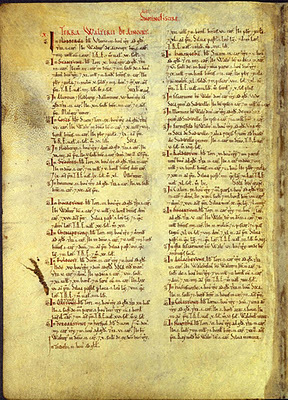 The existence of Oxton was recorded, possibly for the first time, in the Great Domesday Book. 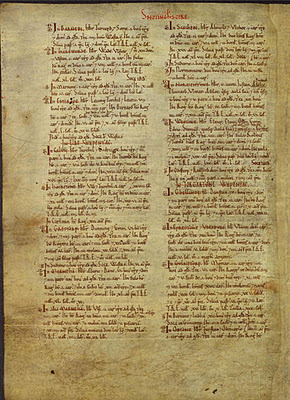 The pages of the Domesday Book listing Oxton are reproduced here by kind permission of the National Archives, together with their translations. (File references 28340, 28542 and 28810). In SOUTHWELL with its Berewicks are 22 ½ carucates of land to the geld. [There is] land for 24 ploughs. There Archbishop Thomas has 10 ploughs in demesne; and 10 sokemen and 75 villans and 23 bordars having 37 ploughs. There are 2 mills [rendering] 40s , and a fishpond, and a ferry [rendering] 6s. Of the same land 6 knights hold 4 ½ carucates of land. 3 clerks have 1 ½ carucates of land; 2 bovates of it are in a prebend. 2 Englishmen have 3 carucates of land 5 bovates. The knights have 7 ploughs in demesne; and 35 villans and 28 bordars having 21 ploughs, and 1 mill [rendering] 8s. The clerks have 1 ½ ploughs in demesne; and 7 villans and 5 bordars having 3 ploughs. The Englishmen have 4 ploughs in demesne; and 20 villans and 6 bordars having 6 ½ ploughs. To Southwell belong 188 acres of meadow. [There is] woodland pasture 8 leagues long and 2 ½ furlongs broad, [and] arable land 5 leagues long and 3 broad. TRE worth 40l ; now 40l15s. In Southwell there are reckoned 12 Berewicks. In North Muskham [are] 1 ½ carucates to the geld. M, B In CROPWELL BISHOP and Hickling, a Berewick, ST MARY of Southwell had 2 ½ carucates of land to the geld. [There is] land for 7 ploughs. The canons have 2 ploughs there in demesne; and 5 sokemen and 15 villans and 4 bordars having 6 ploughs and 2 oxen, and 20 acres of meadow. TRE worth 60s ; now 50[s]..
M, B In LANEHAM [Church Laneham and Laneham] with these Berewicks – Askham, Beckingham, Saundby, Bole, ‘West Burton’, [North and South] Wheatley [and] North Leverton with Habblesthorpe- [are] 9 carucates of land 2 bovates to the geld. [There is] land for 27 ploughs. In the demesne of the hall are 10 bovates of this land. The remainder is sokeland. Now Archbishop Thomas has there 4 ½ ploughs, and 35 villans and 6 bordars having 16 ploughs. There is a church and a priest, and 2 fisheries [rendering] 8s , and 1 mill [rendering] 16s , woodland pasture 3 leagues long and 1 ½ leagues broad, [and] 100 acres of meadow. In the BEREWICKS mentioned above belonging to the manor itself are 38 sokemen and 17 villans and 20 bordars having 14 ½ ploughs. There are also 33 other sokemen and 6 villans and 18 bordars having 15 ploughs. 2 knights hold these with their land of the archbishop. M, B In SUTTON [near East Retford] and Scrooby, a Berewick, and Lound, a Berewick, [is] 1 carucate of land 6 bovates to the geld. [There is] land for 6 ploughs. Archbishop Thomas has there 2 ploughs in demesne; and 14 villans and 6 bordars having 6 ploughs. There are 7 acres of meadow, [and] woodland pasture half a league and 8 furlongs long and 8 ½ furlongs broad. TRE worth 8l ; now the same. In Eaton 2 carucates to the geld. In Tiln 2 bovates and the fourth part of 1 bovate. In Welham and “Simenton” 5 bovates and the fourth part of 1 bovate. In Little Gringley 1 bovate and the fourth part of 1 bovate. In Scaftworth 1 carucate. In Everton 1 carucate and the third part of 1 bovate. This land is [sufficient] for 12 ploughs. There 38 sokemen with 18 villans and 20 bordars now have 25 ploughs. In Tiln 1 mill belonging to Laneham [Church Laneham and Laneham] renders 30s. In [East or West] Retford 1 mill belongs to Sutton [near East Retford]. In Clarborough 6 ½ bovates. [There is] meadow 4 ½ furlongs [partly in margin] long and as much broad and 45 acres in addition, [and] woodland pasture 2 ½ leagues long and 2 leagues broad. In BLIDWORTH the Archbishop of York had 9 bovates of land to the geld. [There is] land for 3 ploughs. Archbishop Thomas has there 5 villans having 2 ploughs, and 1 mill which is in Lowdham. [There is] woodland pasture 3 leagues long and 1 broad. B In Calverton [are] 6 bovates of land to the geld. [There is] land for 12 oxen. There 7 villans and 2 bordars have 2 ploughs. There is a church and a priest, and 2 acres of meadow, [and] woodland pasture 8 furlongs long and 3 broad. TRE, as now, worth 40s. In OXTON Alnoth had 6 bovates of land to the geld. [There is] land for 2 ploughs. There Archbishop Thomas has 1 plough in demesne; and 1 sokeman and 1 villan and 1 bordar having 2 ploughs. The king has 1 bovate of this land. The remainder belongs to Blidworth. TRE worth 40s ; now 20[s].. In RANSKILL [are] 4 ½ bovates to the geld. There is land for 1 plough. It was and is waste. Godric held it. The archbishop holds it. In NORWELL , ST MARY of Southwell had 12 bovates of land to the geld. [There is] land for 6 ploughs. There are now 2 ploughs in demesne; and 22 villans and 3 bordars having 7 ploughs. There is a church and a priest, and 1 mill [rendering] 12d , and 1 fishery, and 73 acres of meadow, [and] woodland pasture 2 leagues long and 1 broad. TRE worth 6l ; now 100s. S In Osmanthorpe [are] 4 bovates of land to the geld. [There is] land for 2 ploughs. There 4 sokemen have 2 ploughs. [There are] 8 acres of meadow, [and] woodland pasture 4 furlongs long and 3 broad. S In Willoughby [in Norwell] [are] 3 ½ bovates of land to the geld. [There is] land for 1 plough. There 4 sokemen and 3 villans have 2 ploughs, and 16 acres of meadow. S In Caunton [are] 2 bovates of land to the geld. [There is] land for 4 oxen. There 1 sokeman and 5 bordars have 1 ½ ploughs, and 2 acres of meadow. [There is] woodland pasture 3 furlongs long and 2 broad. In Hockerton [is] 1 bovate of land to the geld. There is 1 villan and 1 bordar, and 2 acres of meadow. In Woodborough [are] 7 bovates of land to the geld. [There is] land for 2 ploughs. There is half a plough in demesne; and 2 villans and 1 bordar have 1 plough. It belongs to Southwell. In the same place 1 clerk has 1 bovate of land to the geld under the archbishop. In South Muskham and Little Carlto [are] 4 carucates of land 5 bovates to the geld. [There is] land for 9 ½ ploughs. Archbishop Thomas has there 2 ploughs in demesne; and 20 sokemen and 7 villans and 16 bordars having 6 ploughs. There is 1 mill [rendering] 2s , and 66 acres of meadow and 80 acres of scrubland. TRE worth 16s , now 10[s].. 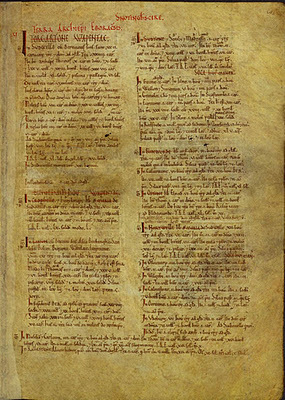 In ROLLESTON Ælfric had as a manor 4 ½ bovates to the geld. [There is] land for 1 for plough, which [plough] 5 villans have there. There are 12 acres of meadow. Formerly 20s ; now it is worth 10s. 2M In BARNBY MOOR Thorfridh and Swarti had 1 1/2 bovates of land to the geld. [There is] land for 4 oxen. worth 10s ; now 12d. ploughs. There Fulk, Roger’s man, [has] in demesne 1 plough; and 8 villans and 1 bordar with 3 ploughs. There is a church, [and] woodland pasture 1 league long and 1 broad. TRE worth 40s ; now 30s. ploughs. [There is] woodland pasture 1 league long and half a league broad. pasture. TRE worth 50s ; now 25s. In the same place [is] 1 bovate of land to the geld. It is SOKELAND. It is waste. long and 74 virgates broad. TRE worth 60s ; now 28s. In HOCKERTON Wulfsige and Thorkil had 1 carucate of land to the geld. [There is] land for 2 1/2 ploughs. broad. TRE worth 4l ; now 3[l]. In Carlton-on-Trent Roger has 12 acres of meadow. 2M In GRASSTHORPE Dunning and Grim had 6 1/2 bovates of land the fourth part of 1 bovate to the geld. woodland pasture. TRE, as now, worth 3l. acres of land, and [there are] 10 villans and 4 bordars having 4 1/2 ploughs. There are 40 acres of meadow. TRE worth 40s ; now 20[s]. In another [? Low] MARNHAM Wulfsige had 2 carucates of land to the geld. [There is] land for 4 ploughs. and as much broad. TRE worth 4l ; now 3l. ploughs. There are 16 acres of meadow, [and] woodland pasture half a league long and 3 furlongs broad. TRE worth 48s ; now 40s. had his hall and each 1 bovate of land the fifth part of 1 bovate to the geld. [There is] land for 12 oxen. There Roger, Roger’s man, has 9 sokemen and 4 bordars having 3 ploughs, and 12 acres of meadow. TRE worth 10s ; now 6s. league long and as much broad. TRE worth 70s ; now 50s. S In “Odestorp” and [East or West] Retford [is] half a bovate of land to the geld. [There is] land for 4 oxen. There is 1 villan, and the fourth part of 1 mill, and 4 acres of meadow. In GEDLING [in Nottingham] Dunstan had 9 1/2 bovates of land the third part of 1 bovate to the geld. ploughs. There is 1 mill [rendering] 5s4d , and 3 acres of meadow. TRE worth 5s ; now 1 mark of silver. In GUNTHORPE Morcar had 3 carucates of land 3 bovates to the geld. [There is] land for 6 ploughs. 2M In OXTON Thorsten and Othenkar had 1 carucate of land to the geld. [There is] land for 2 1/2 ploughs. In FLAWBOROUGH Wulfric had 2 bovates of land to the geld. [There is] land for 1 plough. There Walter d’Aincourt has 1 plough, and 4 villans with 1 plough. TRE, as now, worth 20s. In STAUNTON IN THE VALE Thorir had 10 bovates of land to the geld. [There is] land for 3 ploughs. There are now 3 ploughs in demesne; and 4 sokemen on 1 1/2 bovates of this land 11 villans and 2 bordars having 2 ploughs. There is a priest and a church, and 1 mill [rendering] 5s4d , and 80 acres of meadow. TRE worth 4l ; now 100s. S In Alverton and Flawborough and ‘Dallington’ [in Flawborough] [are] 6 bovates of land to the geld. [There is] land for 2 ploughs. There 12 sokemen have 3 ploughs, and 100 acres of meadow. Mauger holds it. 2M In COTHAM Swein and Thorir had 9 bovates of land to the geld. [There is] land for 6 ploughs. There Walter has in demesne 1 plough; and 10 villans and 8 bordars having 3 ploughs. There is a priest and a church, and 60 acres of meadow. TRE worth 100s ; now 6l. S In Flawborough [are] 1 1/2 bovates of land to the geld. [There is] land for 1 plough. There are 24 acres of meadow. There 5 sokemen have 1 1/2 ploughs, and 24 acres of meadow. demesne 1 plough; and 3 villans and 5 bordars having half a plough, and 60 acres of meadow. TRE worth 60s ; now 40[s] . S In Hawton [are] 2 bovates of land to the geld. [There is] land for 1 plough. There 6 sokemen have 2 ploughs, and 20 acres of meadow. In HOCKERTON Thorir had 3 bovates of land to the geld. [There is] land for 1 plough. There Walter has 1 plough, and 5 villans and 5 bordars having half a plough, and 16 acres of meadow. [There is] woodland pasture 1 league long and 1 1/2 furlongs broad. TRE worth 20s ; now 15[s]. In KNAPTHORPE Thorir had 4 1/2 bovates of land to the geld. [There is] land for 1 plough. There is in demesne 1 plough; and 5 villans and 3 bordars having 1 1/2 ploughs, and 2 acres of meadow. [There is] woodland pasture 8 furlongs long and 2 broad. TRE, as now, [worth] 20s. In BULCOTE Swein Cild had 2 carucates of land 2 bovates to the geld, and in the same place 15 1/2 bovates of land to the geld, SOKELAND of the same manor. [There is] land for 5 1/2 ploughs. There is in demesne 1 plough; and 8 sokemen and 11 villans and 12 bordars and 2 slaves with 3 ploughs. There are 76 acres of meadow, [and] woodland, pasture in places, 1 league long and 8 furlongs broad. TRE, as now, worth 4l. In OXTON Thorir had 4 bovates of land to the geld. [There is] land for 12 oxen. There is 1 sokeman on the third part of 1 bovate of this land, with 1 bordar, having half a plough, and 4 acres of meadow. TRE worth 16s ; now 5s4d. In Tythby [are] 2 bovates to the geld. and 12 villans and 2 bordars having 6 ploughs. There is a priest and a church, and 40 acres of meadow, [and] woodland pasture 1 league long and a half broad. TRE worth 3l ; now 4l. In HOVERINGHAM Swein had 2 carucates of land 2 bovates to the geld. [There is] land for 4 ploughs. There Walter has in demesne 2 ploughs; and 6 sokemen on 3 bovates and the third part of 1 bovate of this land 9 villans and 3 bordars having 4 ploughs. There is a priest and a church, and 2 mills [rendering] 40s , and 2 fisheries [rendering] 8s , and 40 acres of meadow. TRE worth 4l ; now the same and 10s more. S In Fiskerton Walter has half a carucate of land to the geld, of which the SOKE belongs to Southwell. There he himself has 1 plough, and 3 villans with 1 plough. S In Morton [near Southwell] Walter has half a carucate of land to the geld, of which the SOKE belongs to Southwell. There he himself [has] 1 plough, and 3 villans have 1 plough. S In Farnsfield Walter has 2 bovates of land to the geld. One is in the SOKE of Southwell and the other in the king’s [soke], but nevertheless it belongs to the hundred of Southwell. There is 1 plough in demesne. TRE worth 5s ; now 8s. In ROLLESTON Thorir had 11 bovates of land the fourth part of 1 bovate to the geld. [There is] land for 2 ploughs. There is 1 plough in demesne; and 8 villans and 6 bordars having 3 ploughs and 3 oxen. There is a priest and a church, and 32 acres of meadow, [and] woodland pasture 4 furlongs long and 2 broad. TRE worth 40s ; now 60[s]. s In Kelham [are] 9 bovates of land the third part of 1 bovate to the geld. [There is] land for 2 1/2 ploughs. There 18 sokemen and 3 bordars have 7 1/2 ploughs, and 16 acres of meadow. [There is] scrubland 9 furlongs long and 50 virgates broad. In FISKERTON Thorir had 2 carucates of land 2 bovates to the geld. [There is] land for 5 ploughs. There Walter has in demesne 1 plough; and 11 villans having 4 ploughs. There are 2 mills, and 1 fishery, and 1 ferry [rendering] 46s8d, and 42 acres of meadow, [and] woodland pasture 2 furlongs long and 1 furlong broad. TRE worth 3l ; now 4[l]. S In this Fiskerton Walter has 6 bovates of land of which the archbishop has the soke. In ASLOCKTON Thorir had 1 carucate of land to the geld. [There is] land for 3 ploughs. There Walkelin, Walter’s man, has 2 ploughs, and 1 sokeman on 1 bovate of this land 6 villans and 2 bordars with 1 1/2 ploughs, and [there are] 24 acres of meadow. TRE, as now, worth 30s. S In Hawksworth [is] 1 bovate of land to the geld. [There is] land for 2 oxen. There 2 sokemen and 1 bordar have 2 oxen in a plough, and 2 acres of meadow. In CAR COLSTON Thorir had 2 1/2 bovates of land 1 acre of land to the geld. [There is] land for 1 plough. There 1 bordar ploughs with 1 ox. There are 3 acres of meadow. TRE worth 10s ; now 5s. Walkelin holds it. Welcome to the community website for the beautiful village of Oxton in the scenic and legendary Sherwood Forest. WATCH OUT, THERE’S THIEVES ABOUT! Yeah!! Oxton Has A New ‘Social Committee’!! Mark Foxwell on 2018 OXTON FETE UPDATE – What A Great Day! Jill J on 2018 OXTON FETE UPDATE – What A Great Day!